The opportunity slipped away in the final seconds against No. 5 Purdue. 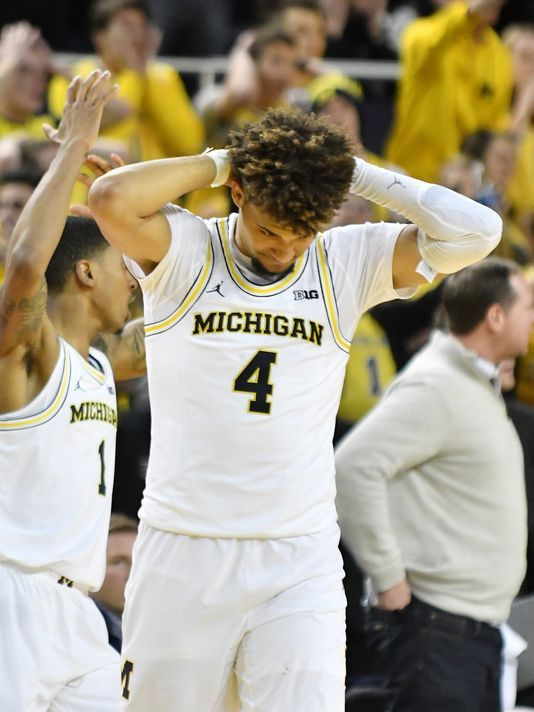 Michigan rallied from a 14-point deficit only to have a critical turnover and foul lead to a tiebreaking free throw by Isaac Haas with four seconds left in a 70-69 loss Tuesday night at Crisler Center. Zavier Simpson had 15 points and Charles Matthews added 14 but had a desperation 3-pointer rim out as time expired for Michigan (14-4, 3-2 Big Ten), which saw its seven-game winning streak end. “That one hurts,” Michigan coach John Beilein said. “That was a great opportunity for us to beat a really good basketball team. You go from the height of emotions of having the ball with 25 seconds to go to having the ball out of bounds with five seconds to go and then not having the ball out of bounds and then have a foul. But it’s part of the game and we have to learn from it and get better from it. Purdue (16-2, 5-0) and Michigan traded shots over the final 10 minutes during a tight, back-and-forth second half until the game came to a standstill when Matthews was stripped by Dakota Mathias on a drive to the basket in the final seconds with the score tied at 69. The ball was originally awarded to the Wolverines with 5.8 seconds left before Purdue coach Matt Painter asked the officials to review the play. “They just said it hit (Matthews). I had no clue,” Painter said. “I’m so far away from it, but you’re in that moment so you might as well and they’ll go and look for it.